We were not officially married when we were in England. When Jason had a job offer in Malaysia, we had to register our marriage as I needed a spouse visa. I asked dad to go to the registry office in Japan to hand in the application for marriage. (In Japan, you don't have to be there to register.) It was 2 years ago. We haven't had a wedding reception. If we had a girl, she would demand to show our wedding photos when she grew up. But boys don't care much, that I was thinking. It was wrong. Arata has started to say, "I want to see your wedding photos." 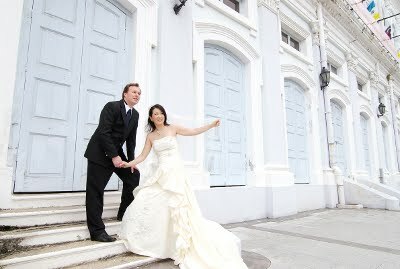 I was reluctant to have it done as we were no longer newly-wed and too busy with everyday life. But a couple of friends of mine gave us an opportunity to do so as my birthday present. Well, it was a surprise until Jason took me to the photo studio. As same as in Singapore, you can see a young couple being taken wedding photos all over the place. They are pausing as if they were actors or actresses.... To be honest, I didn't imagine I would ever do that too! It was a whole day effort, from 9 AM till 5 PM. We had 5 different dresses and suits, in the studio or outside location. I was exhausted by the end. Still I didn't forget to request to alter the photos as much as possible, even they look unnatural! 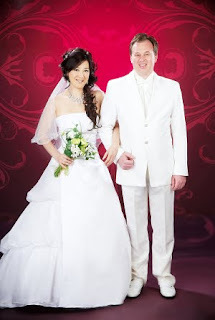 With all our efforts and my friends' generosity, we now have quite a few nice wedding photos! All the photos are so lovely. You are a beautiful bride. Your husband looks great in the Chinese costume.